Yes, pretty standard that colour for my hands, even when I'm not at work! The calculator is my dad's, his vernier caliper is in similar state but with a sticking plaster instead of tape. And also I'm glad my swahili is becoming more fluent! I'm hoping to be able to put a few bits together before long. We had a bit of a change of plans this evening so it has allowed a bit more 9F progress. 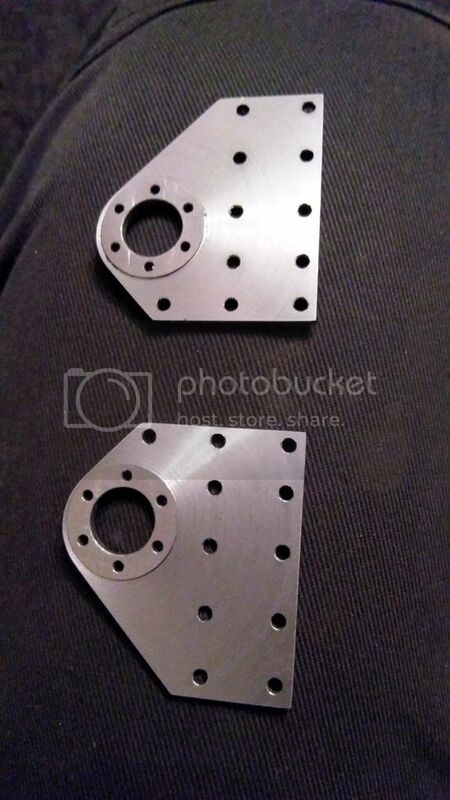 I decided it would be best to finish off the Rear Brake Shaft Brackets. First I clamped them direct to the mill table and machined there thickness over the boss. Didnt get a picture however. 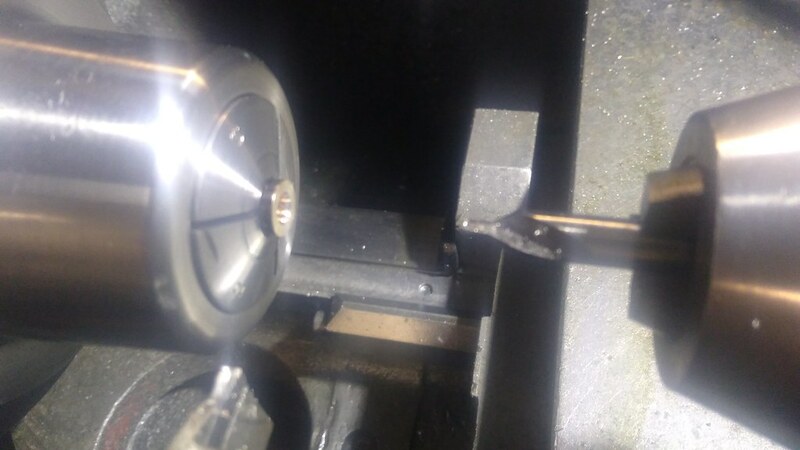 They were then taken over to the Lathe and after turning a peg to push them with a center and another peg in the chuck to align them I faced them to produce the boss. And the finished artical looks like so. Many thanks for the latest info' VB. Looking forward to some more, in due course. 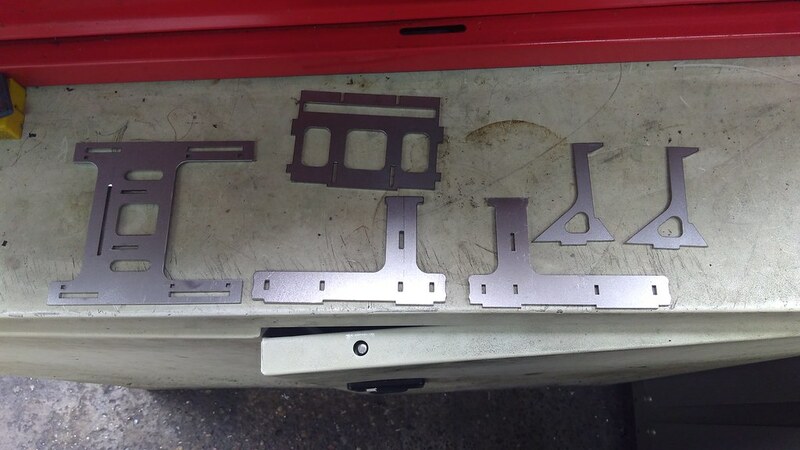 Progress has continued with remaking the Rear Brake Shaft Brackets. 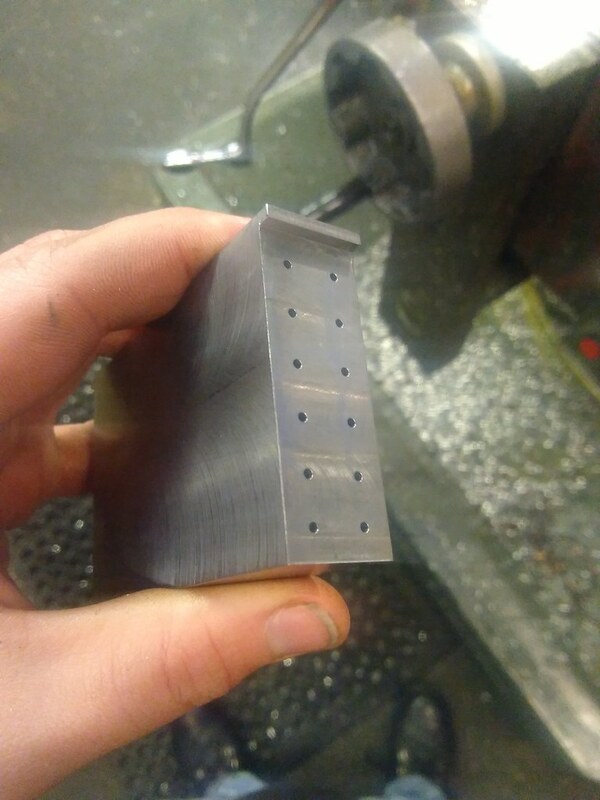 I started off the next piece by turning up some discs with a hole in it... And then bolted it to one of the cheese plates we have at work, then I drilled the holes (the bolt was also slightly adjusted) and milled the profile. 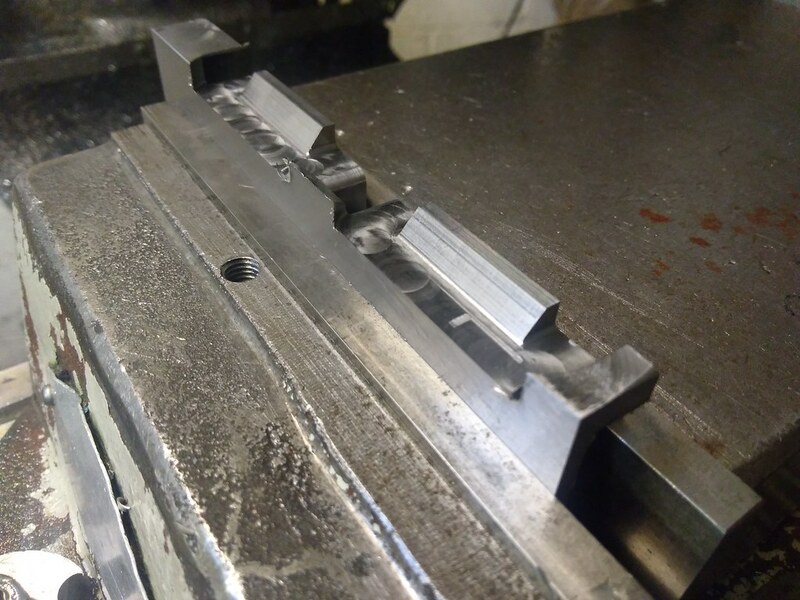 Then, bolt removed, pieces cut in 2 and then using 2 drills, the pieces all put together and put into the vice to mill the edge to size. 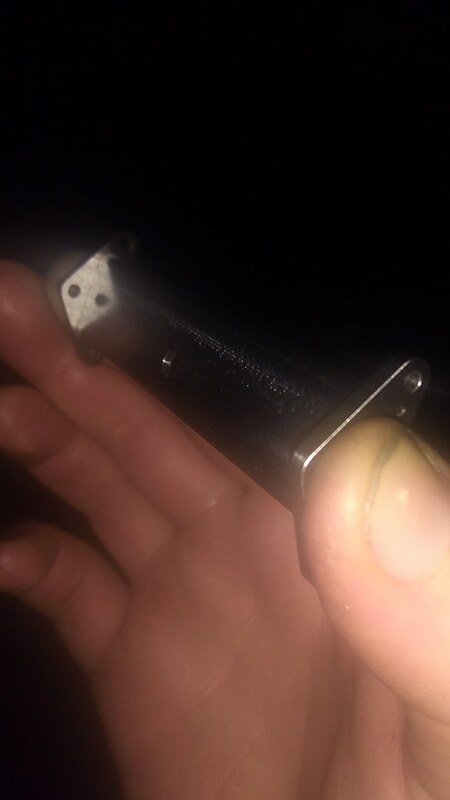 And the 2 small holes will be used for dowls to locate the U channel that I goes between the 2 bits. Hopefully i'll get that made before long. Many thanks for the Update VB. A completely different approach to what would be used in a typical "home workshop". Fascinating. Keep these reports coming, VB. Sooty655 wrote: A completely different approach to what would be used in a typical "home workshop". Fascinating. I keep saying it, but I'm very lucky to have access to these toys at work. It's a shame i don't have any kind of workshop at home. Progress would be much quicker. Hello again everyone, i'm guessing you think i've forgotten you... Well, I havnt, but i've devoted the summer to my beloved Land Rover, however, the little 9F is now back at the front of my mind for a while so heres the first update for you. 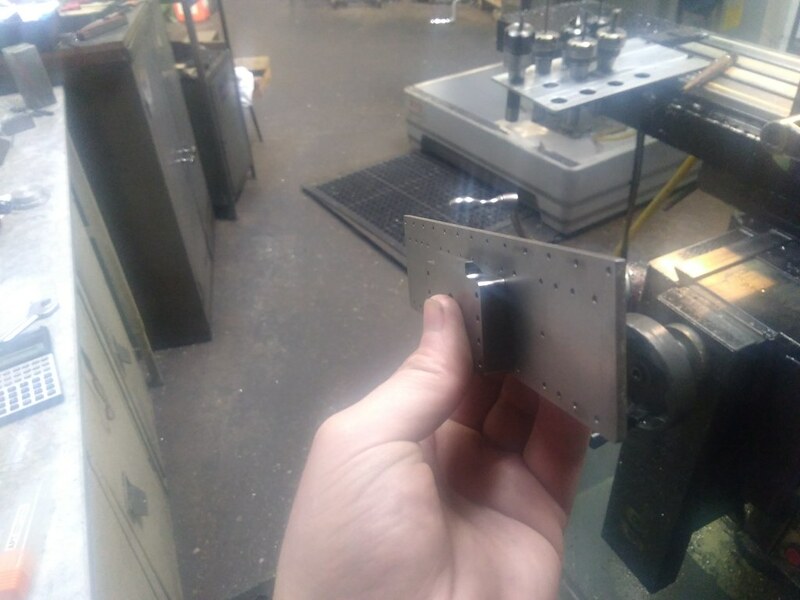 Before I vanished, I got a few things screwed together, this being the whole front drag assembly, so all the rambling about Gussets has come to an end... (that is actually a very fat lie). 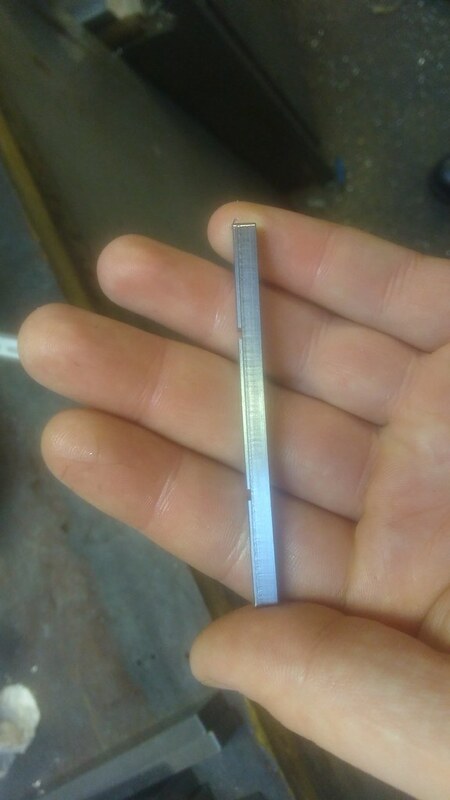 And I also ordered another stretcher from the laser cutters.. 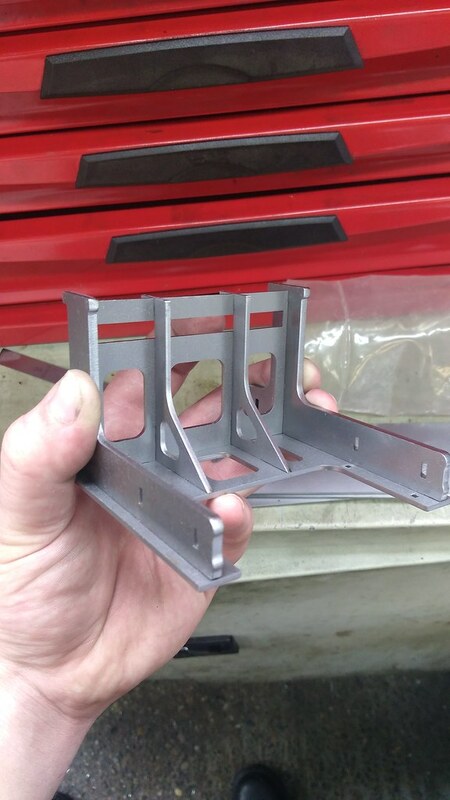 This one will support the Front of the Firebox when its done. 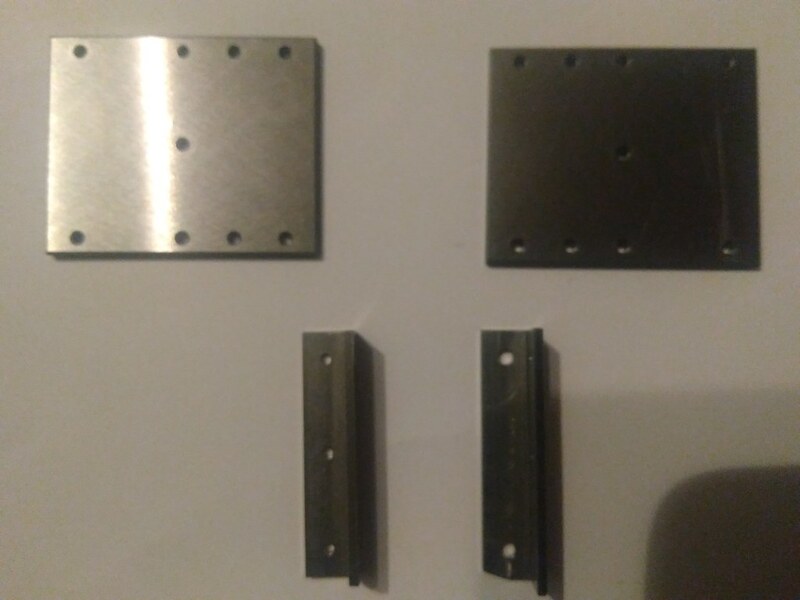 I made bolt pads to suit 2 vertical stretchers that havnt been seen for about 18 months, and i also did the one for the the Firebox Support Stretcher. that brings you upto date for the end of april..
First job now im back onto the 9F wast making the U Channel required for the Rear Brake Shaft Support, I didnt take many photos of this, but i Set about doing this arse about face, its a lot easier to form the radius on the pro when you cant find a 2.5mm Corner rounding cutter.... Trouble is, the pro wasn't available when i started. 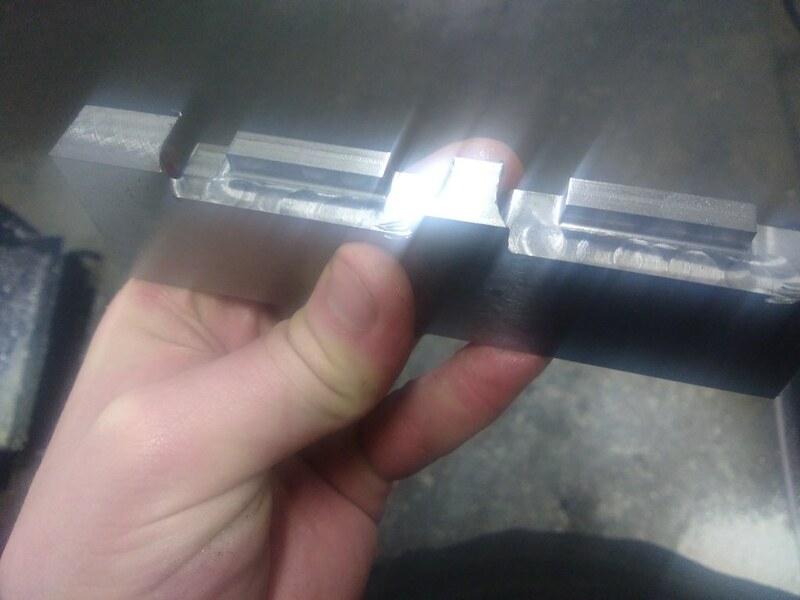 I had to form the radius last of all when finishing the thickness, hopefully you can see the radius appearing in this picture. 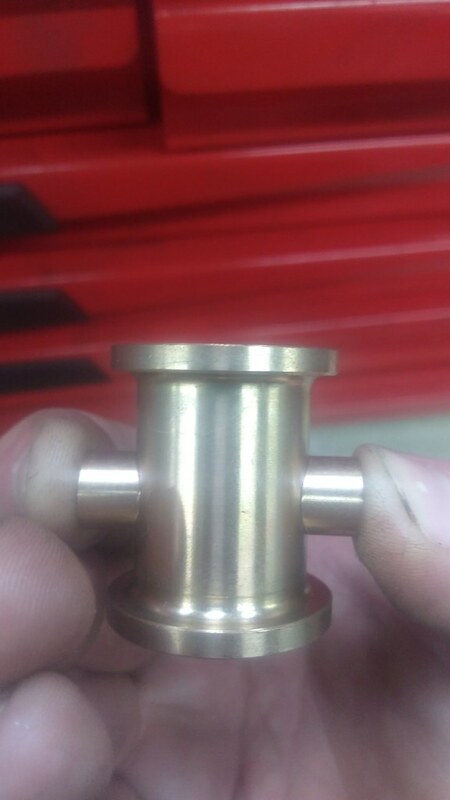 And finally, As a fill in job some time back i turned the Steam Brake Cylinders, I have now also made its Trunions to mount it.. these just started as a bit of bronze that was turned and Drilled. 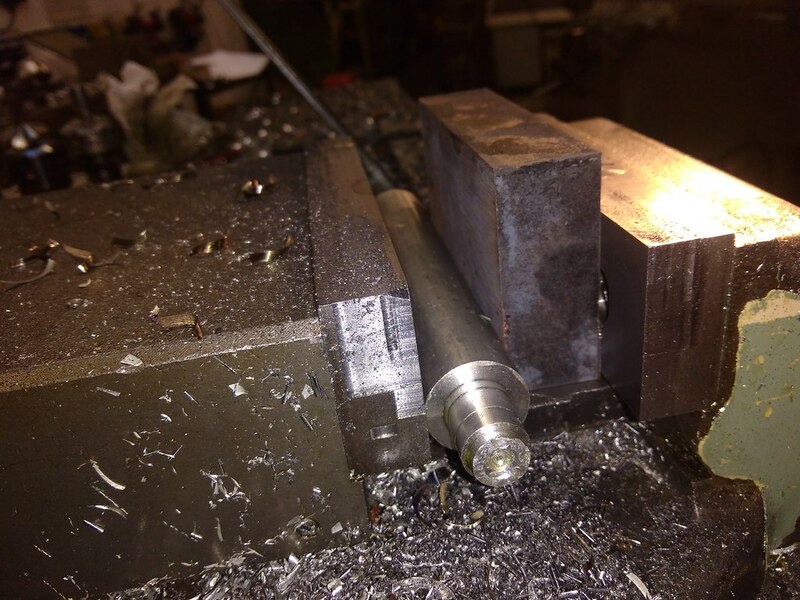 I then machined a scallop in either end to fit the Steam Brake Cylinder. Then I put them back in the Lathe and parted them into 2 bits. I used the center drill to add a small lead to the Trunion to assist lining everything up in a fixture when there soldered together. 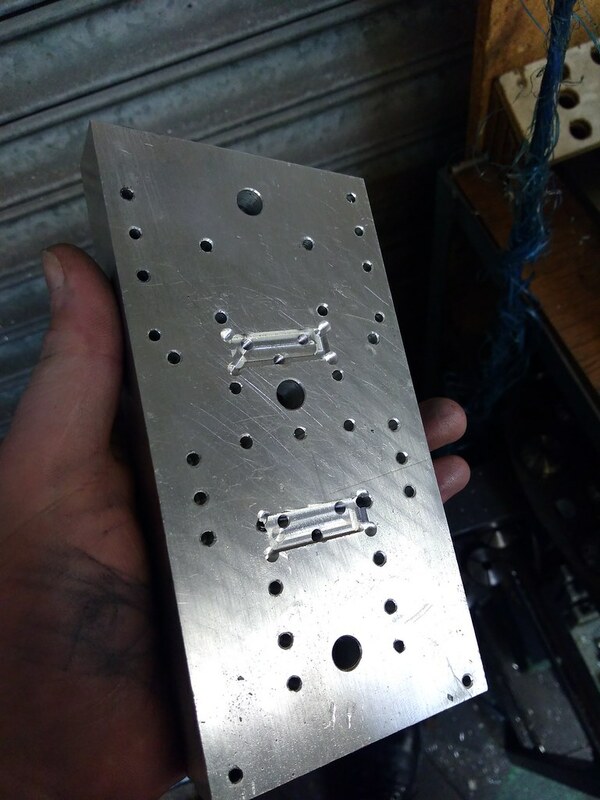 I now have just 1 bit to make and then I need to organise a big Soldering party, that will see the Rear Drag Box, a Firebox Support Stretcher, and 2 Vertical Stretchers ready for final Machining, and ill also just have the ends to clean up on the Brake Shaft Carrier. Many Thanks for the Update VB. Glad to have you back. I've missed your 'Progress Pics'. 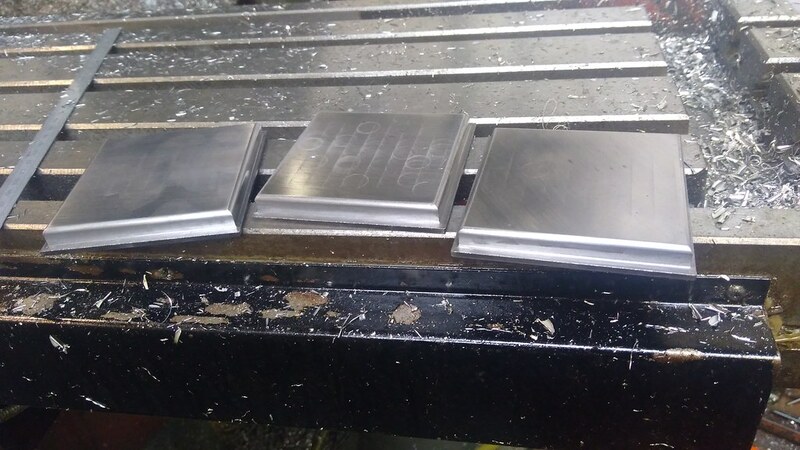 For the last couple of weeks i've had unhindered access to the pro at work so I have started and finished the 4 Gussets that go between the Frames and the Rear Drag Beam. 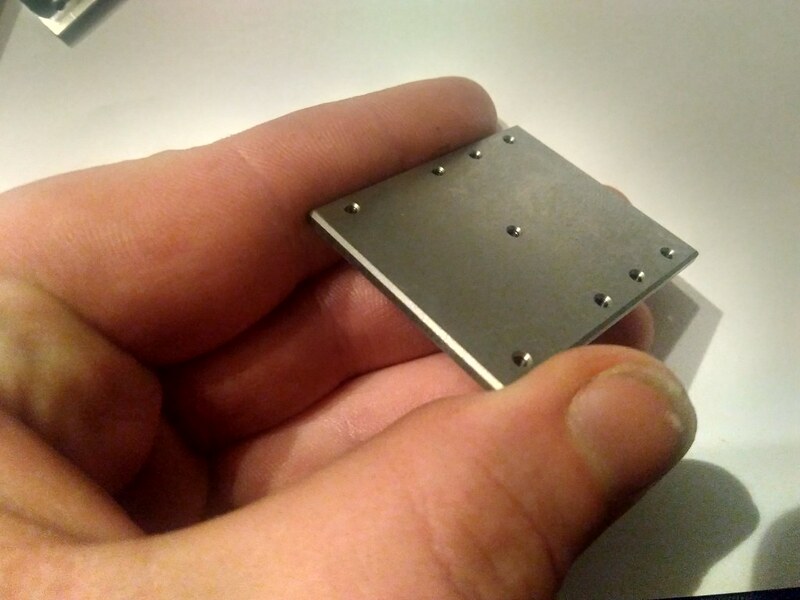 First op was to Mill a block square with a 2.5mm radius on the outside edges. 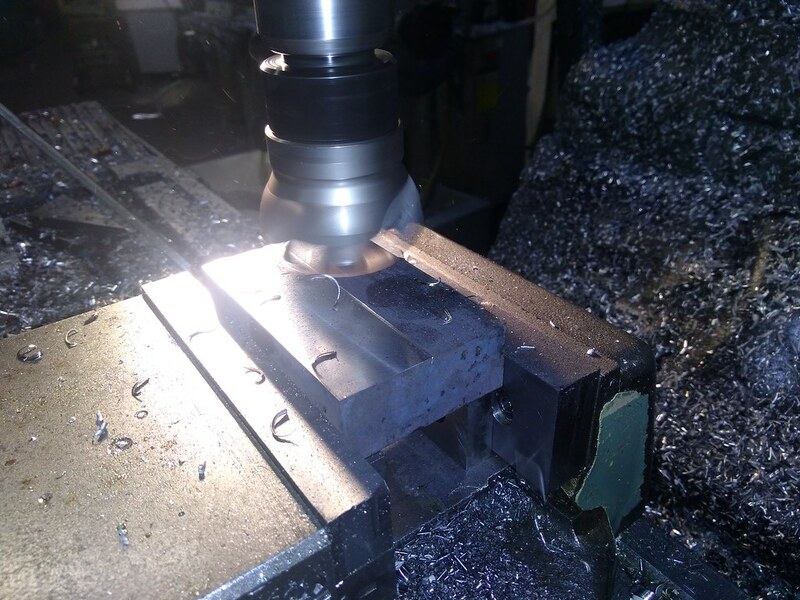 In the first picture i've milled round the outside and now taking the excess off the top, just using a 1mm stepover the machine runs safely and quietly during works time while i get on with earning my wages. 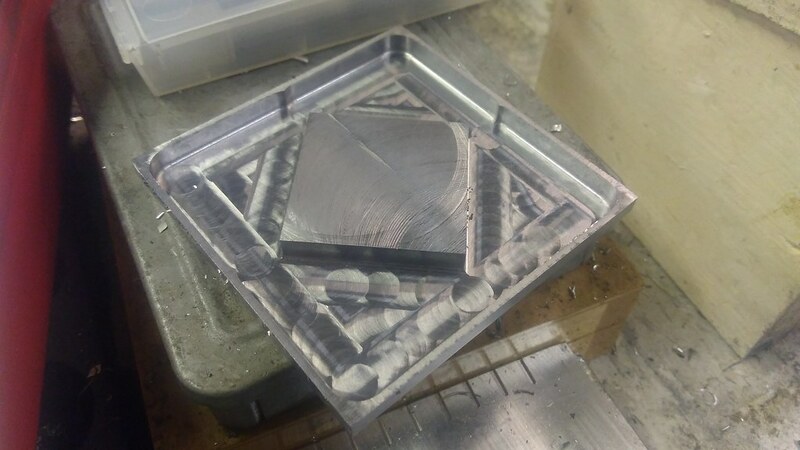 Next, I turned the blocks over and machined 4 triangular sections, I left the middle because there was nothing to gain by removing it. Then I stood the block up and removed the corners and then Drilled the holes in the side. Next, I made a little fixture and clamped the gusset I was separating from the block. And after deburring they look like so. 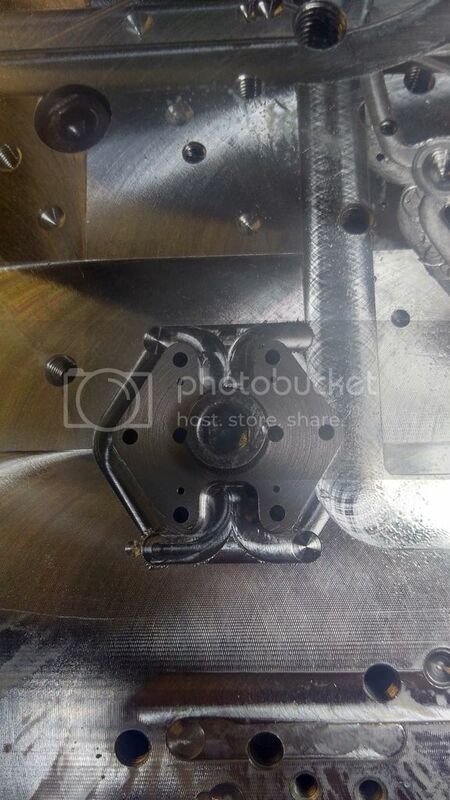 Hopefully you will have noticed one is different, thats not a mistake, its different because it clears a water feed pipe for one of the injectors. A very neat way to make them, VB, but I have to wonder what tonnage of metal would have been needed if the original 9F had been made this way. 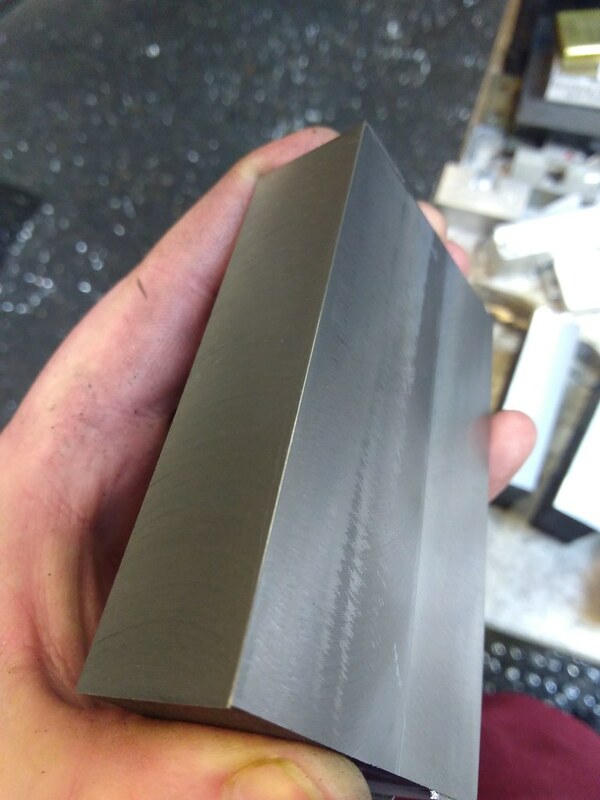 One of the joys of "home" machining is that scrap amounts aren't a consideration. Certainly not in my workshop. 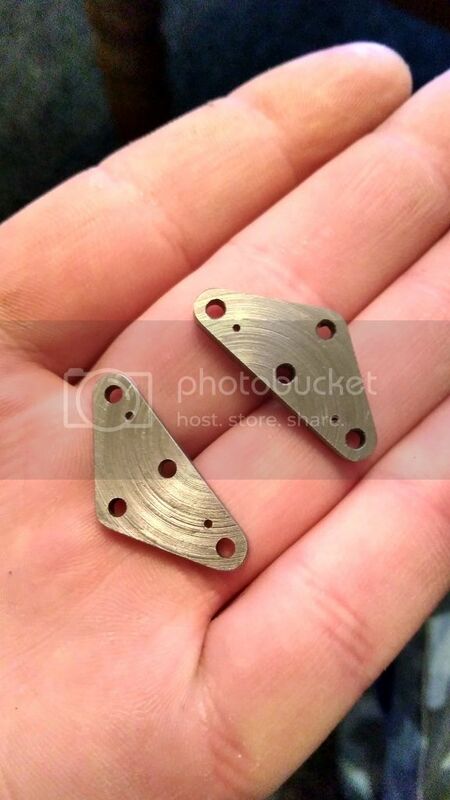 Hi Eric, the full size ones were made from a flame cut and bent piece of ½ inch steel plate. Making one in full size from a solid would probably take a couple of days in 1955 when the 9Fs were being built. 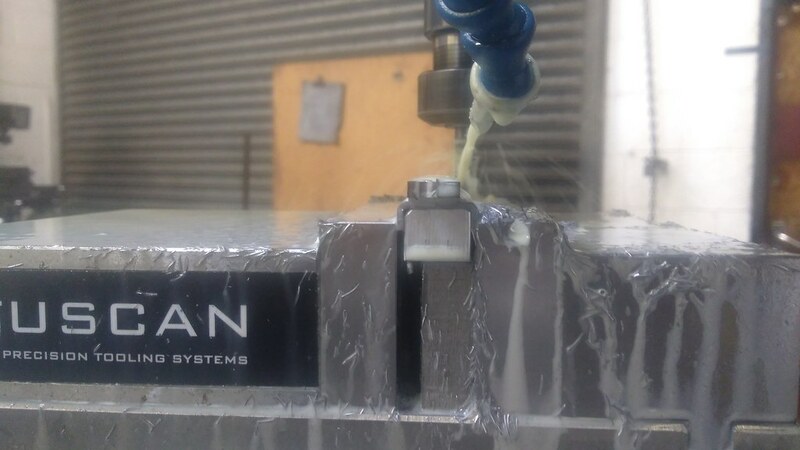 Using modern day tooling and equipment would probably get that down to about a day so yes, not the most cost effective way to do it. 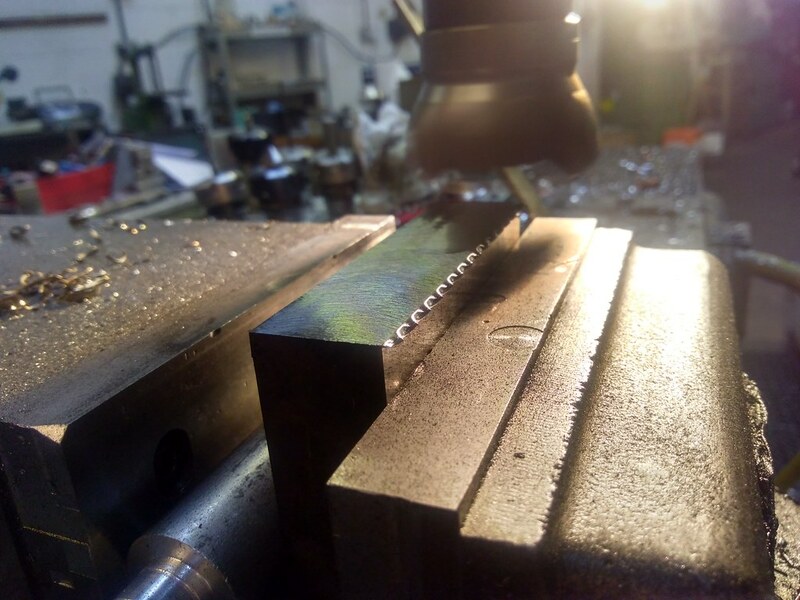 Fortunately the amount of waste doesnt bother me, the steel i use is from left overs/off cuts/scrap from either where i work or via a good friend from where he works. Unfortunately my workshop is work and Scrap is very much frowned upon... I try to apply that to the 9F as well. I wasn't going to admit to this yet, however, last Saturday we attempted to weld together the Rear Drag Box I made a kit of parts for some time back.... Couldnt get the whole thing to fit together, a bit of thinking and then the lightbulb lit, I'd drilled the side plates the wrong way up and i cant redrill them because a location hole would be come a useless slot.. now, if you can remember that far back I'd already made them and scrapped them because i had the profile laser cut 2mm to short.. so I have now ordered the 3rd set of laser cut plates! 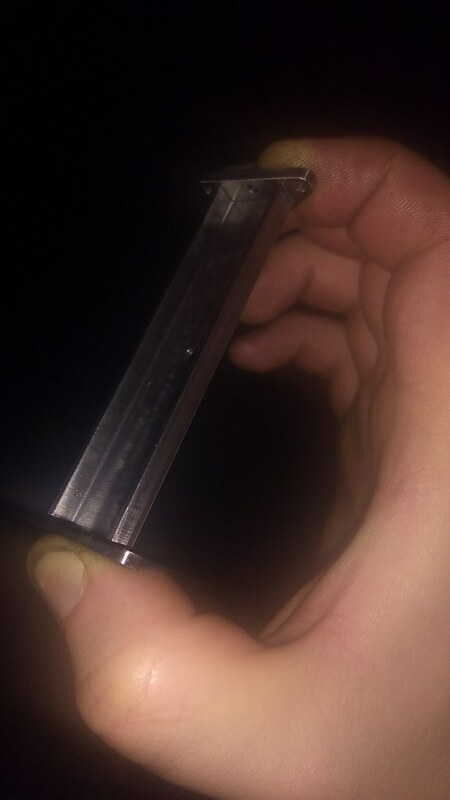 I was meaning scrap in the sense of the amount of metal in the cuttings compared to the amount left in the finished component. It is always annoying when something has to be binned and restarted. How does the saying go? Measure twice ~ Cut once ~ Swear ~ Measure again. Ah well swarf is a different matter. 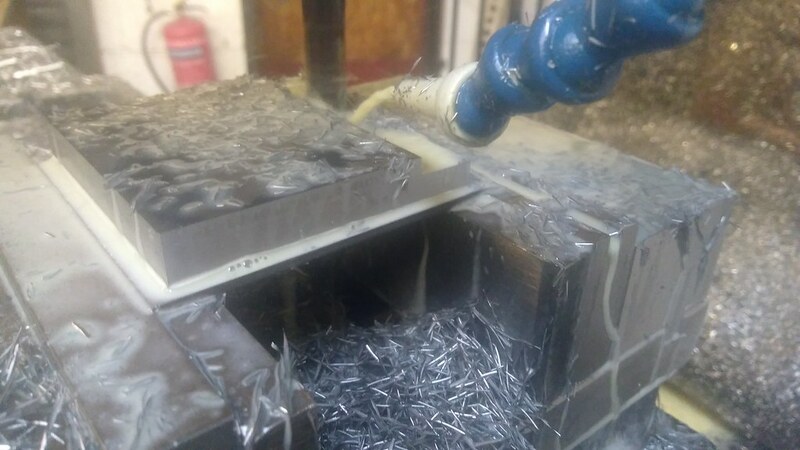 I enjoy making swarf! I could of got 3 bits of plate to make the gussets and silver soldered them together. But it would cost me some plate, solder, flux and propane.... This way cost me nothing. I also set out to machine as much of the 9F as i could from solid, just to see what i can actually do on thenmachines. 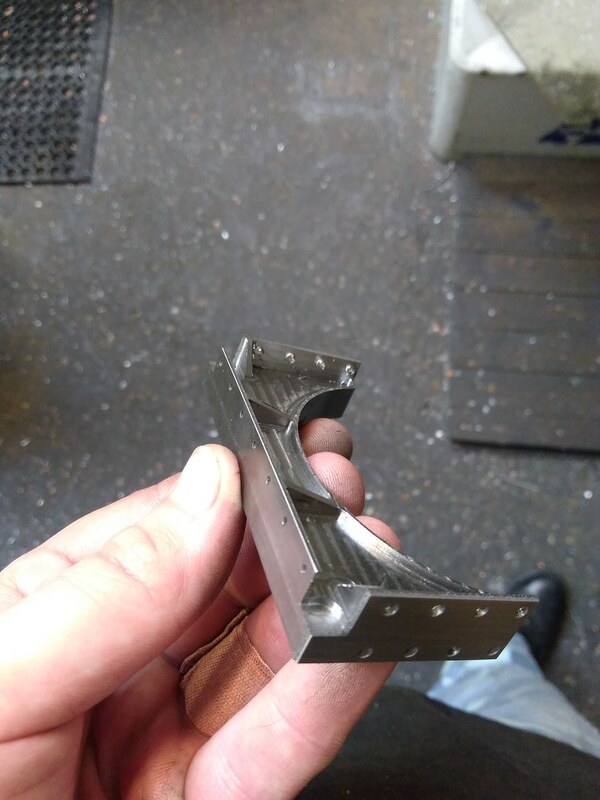 Some more bits to show on my 9F..
And also some more angles, these fit outside the frames onto the rear drag beam, They also run through the corner cutouts in the gussets i showed in the last update. Hopefully, something a bit more exciting next time. Thank you VB. Keep the Updates coming. 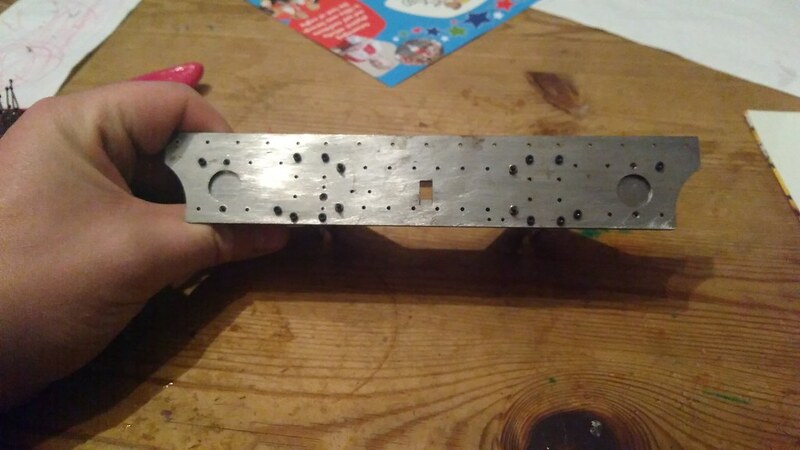 Just a quick update tonight to show the Rear Drag Beam now i've drilled all the rivet holes, think its 48 in total. you can just see in the back of the picture the fixture I clamped the Beam to... its the same fixture I milled the Horizontal stretchers on over a year ago. Many thanks VB. A lot of drilling! Last report for you this year, I had hoped to do this a week ago but it obviously wasn't to be. 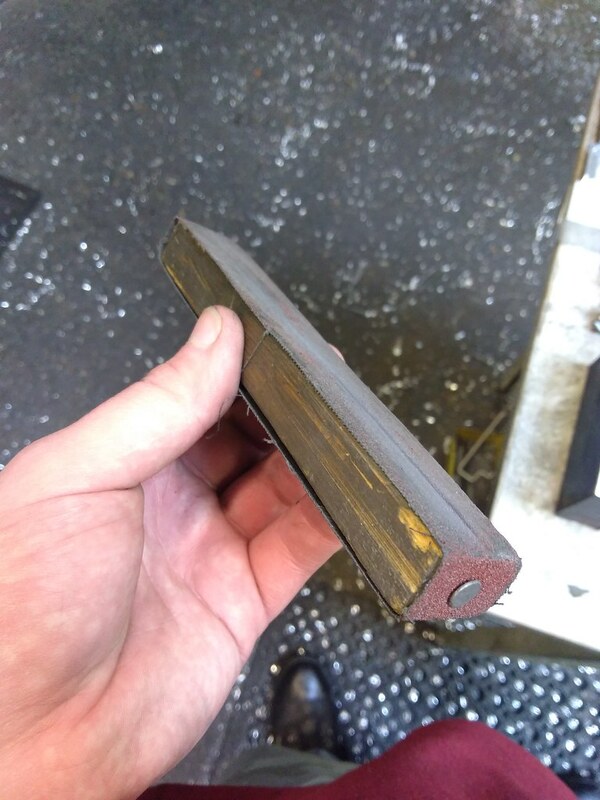 I concluded that I should probably make the last bit in need to fit the Rear Drag Beam on the Loco, so i have started on the Intermediate Rubbing Block. 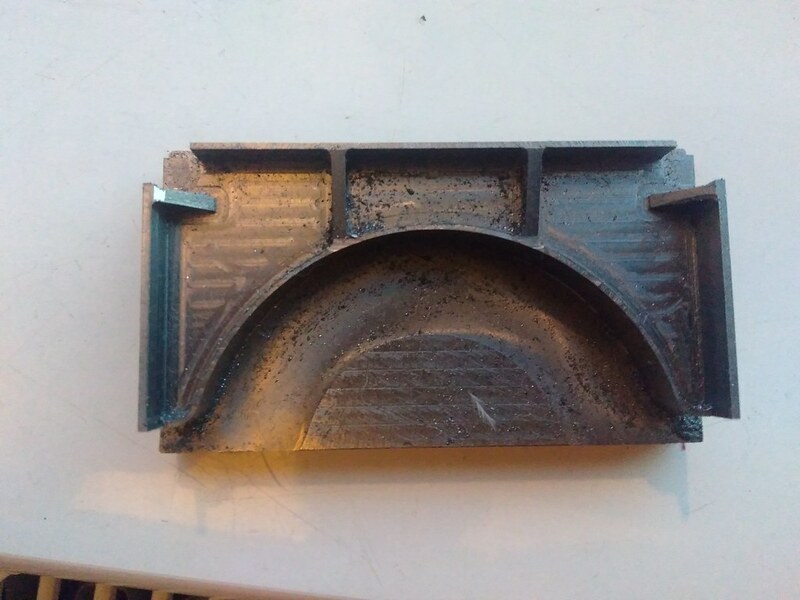 These were originally a Mild Steel Casting with 2 Liners welded to it for increased wear resistance, I have decided to machine mine from gauge plate. 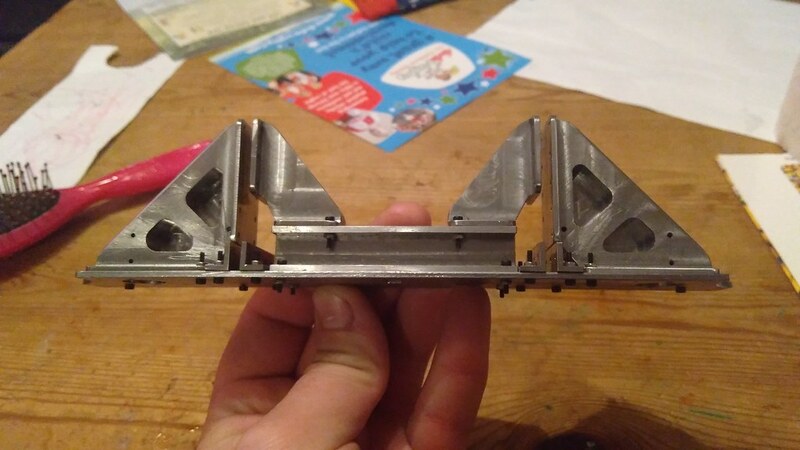 I'm actually making 4 of these, the BR1 Tender uses the same Rubbing block and also, if the 9F ever gets finished, I would like to make a BR standard 4 2-6-0 with a BR1 tender, again the same blocks will be required, so I will make them now and hopefully not lose them for when there needed in the future. 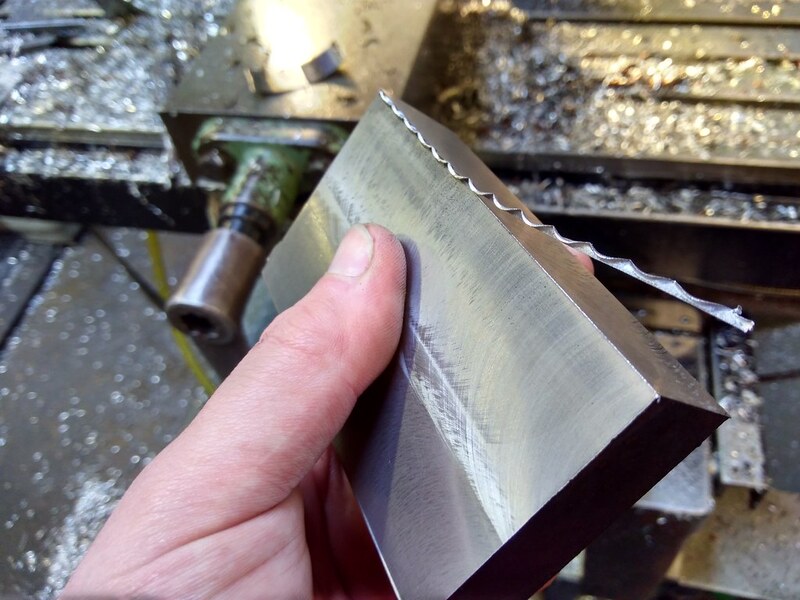 Anyway, first job was to mill the outside profile into the Selected bit(s) of Gauge plate. 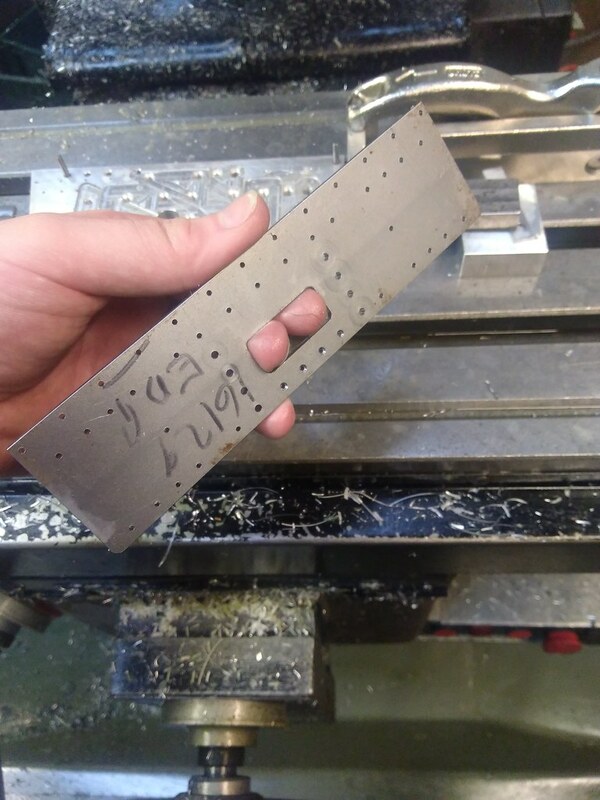 Next holes were drilled, the 3 grouped in the middle are tooling holes. 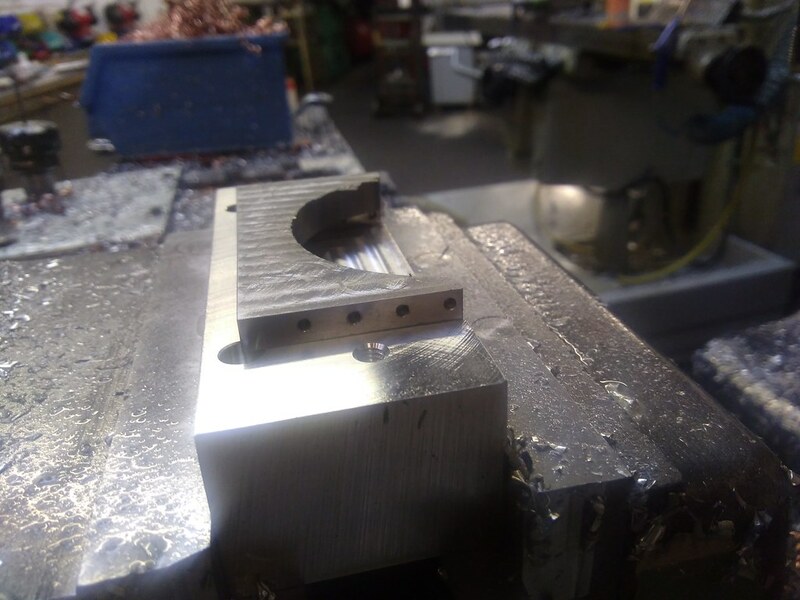 Next, I stood the blocks up in the vice to finish the little up stand at the top of the block, this needed a 1mm corner rad in it, not the 3mm left from milling the profile. Also to show, but I take no credit for is another vertical stretcher, its all Ed's work. This one hovers over one of the Horizontal Stretchers. I've taken these from Ed to make him a block to support the Stretcher in the vice when he machines all the meat out the 2nd side. 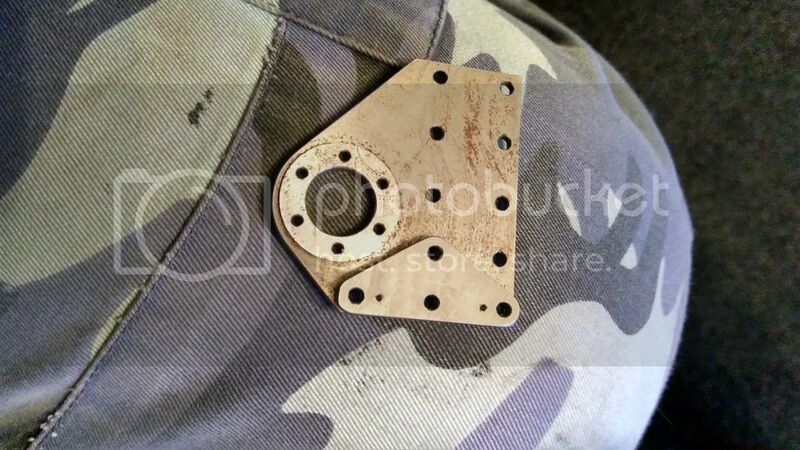 I will also remove the stock material and drill the rivet holes in the sides and bottom face. And with that I hope you had a good christmas, and i'll wish all that read this a happy new year. And a Happy New Year to you, VB. Please keep the reports coming in 2018 ~ this is fascinating. Thank you VB for another detailed and (as Sooty said) fascinating Update. Look forward to more coming in 2018. Wishing you (and all your 'Readers') a very Happy New Year. PS: A 'Standard 4' sounds like a great 'future' Project. Finally time for another update on the 9F, unfortunatly, working 60 hrs a week is hampering my updates for you guys and progress on the engine! 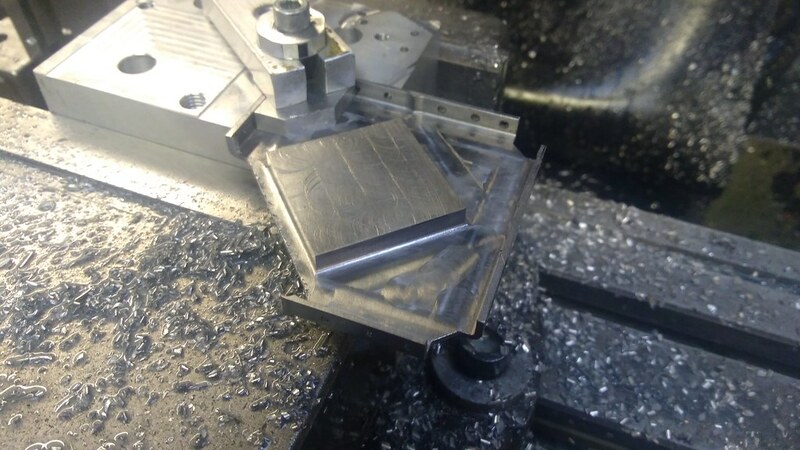 Progress has been made on the Intermediate Rubbing Blocks, first job was to machine the angle on the back edge. I did this by tipping the head over on our manual bridgeport at work. Next I jumped on the pro to mill the 2 pockets with a 2.5mm PCB Ball nose cutter each pocket took a couple of hrs. 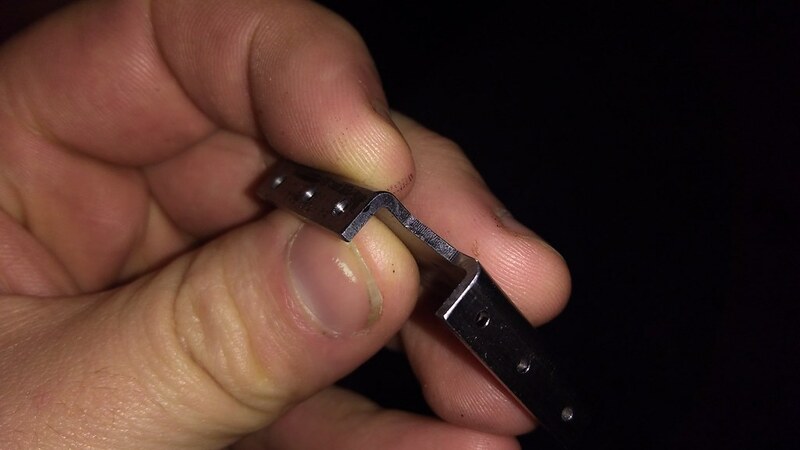 Next, I took the bulk of the material away from the back of the Blocks, this left me able to just bend the metal by hand and brake the 2 apart. I then finished the back face of the Blocks. And the final picture tonight shows the blck located on the Rear Drag Beam. 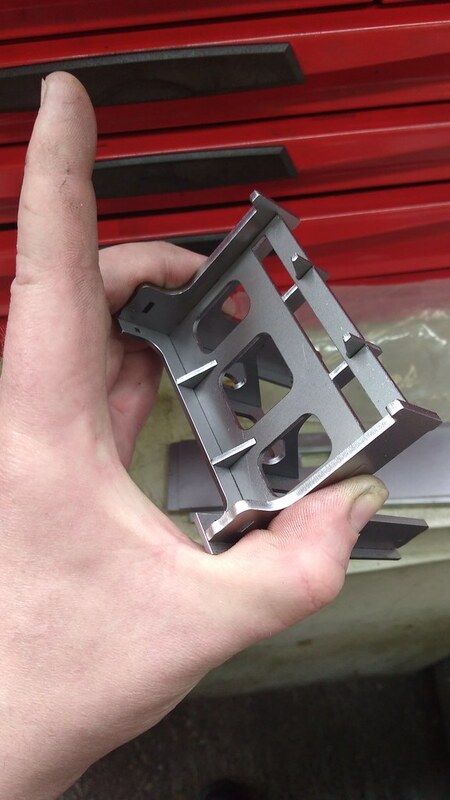 Next week I will have to make a fixture to hold these for the clever bit of these to start. Finally found some time for your next update, i've actually done a few different thing since my last one. 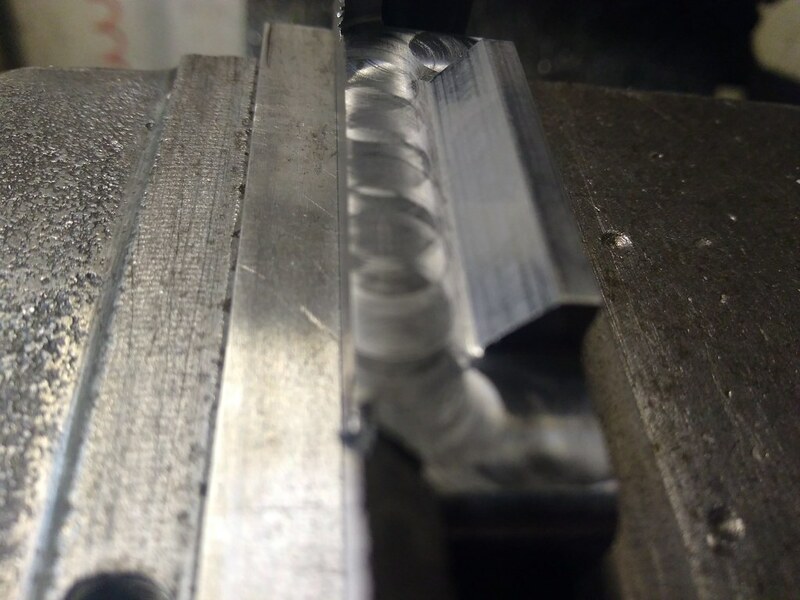 First thing was to make a fixture for the Rubbing blocks. That looks something like this, hopefully you will see it in action soon. 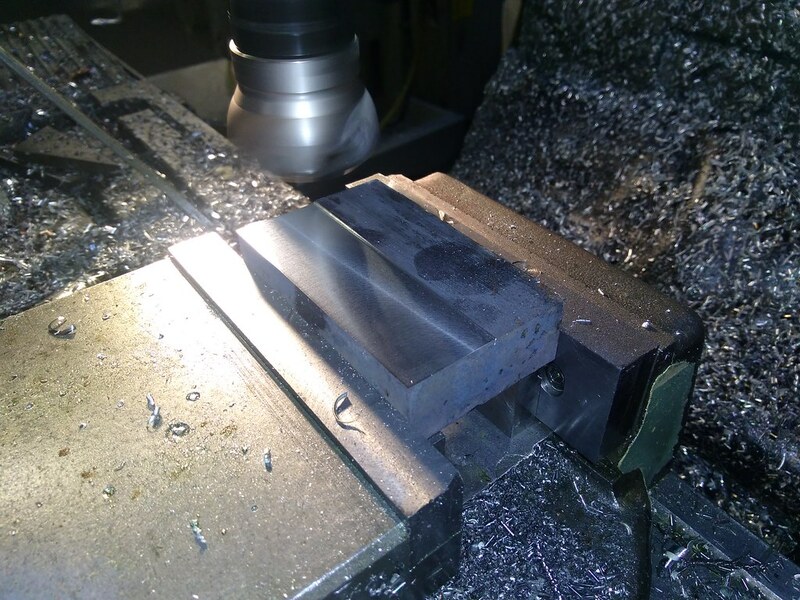 I've also machined to thickness and Drilled the stretcher Ed had started. I then made fixtures and clamps finish these off. The Stretcher is now with Ed again for him to finish off for me. 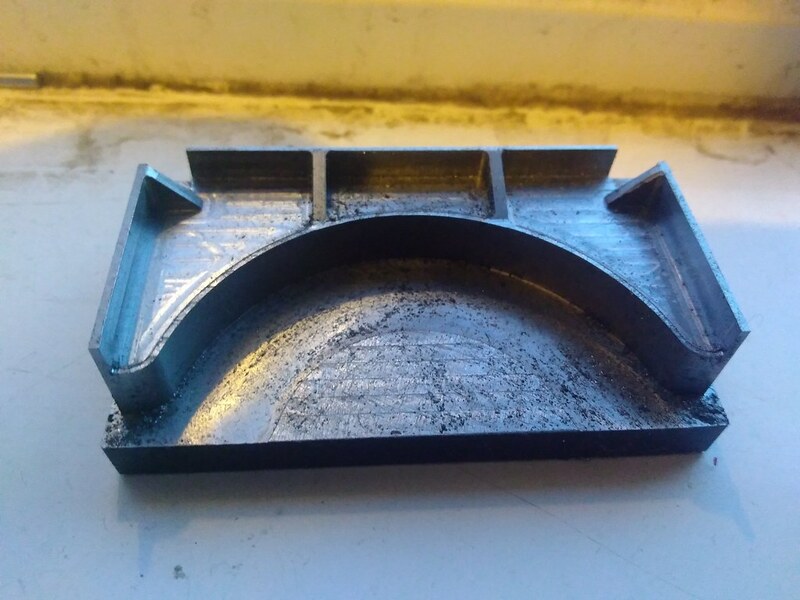 Next, i've made some decent head way into yet another Stretcher, this one is the Boiler Support Stretcher and again, its milled from solid, the full size ones were fabricated. The works drawing for this is no longer available so Bob has kindly let me use the drawing he made to do his. 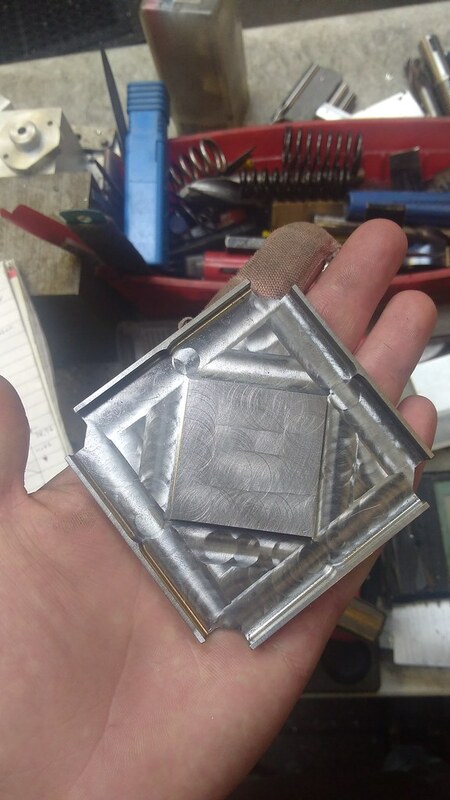 I watched some time ago one of out professional millers at work teach the apprentice how to block something out, the apprentice followed the instructions to the letter and made a Rhomboid, not a square block as planned. The stretcher needed blocking out first so i've taken some pics, and will attempt to explain what I do to you guys. Hope a few find it helpful. Oh and make sure your head is square to your table. First take your billet, remove the burrs and throw it into your vice and clean up your BIGGEST face..... Oh and make sure your head is square to your table. once this face is cleaned up, it becomes your datum face. 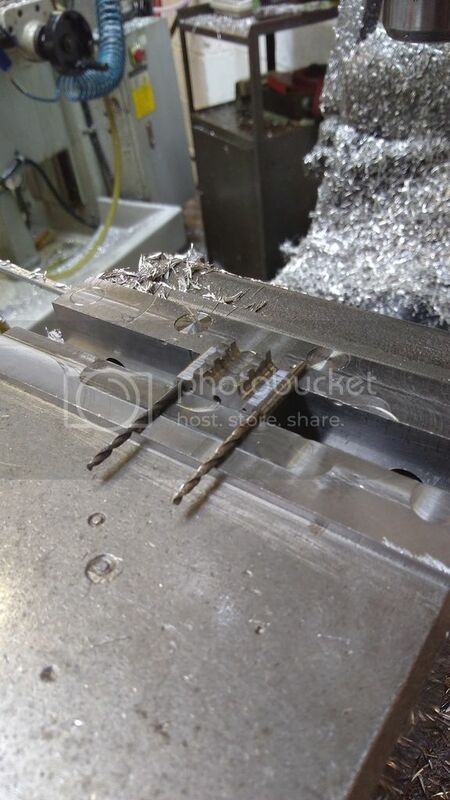 Next remove the burrs, then the freshly machined face goes up against the vices fixed jaw. You then need a roller, and the lower it is in the vice the better. 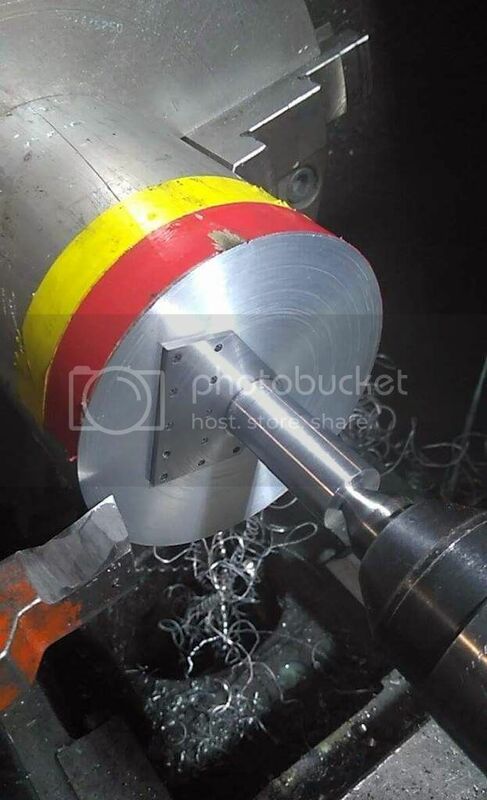 The roller is used to get rid of the effect of the moving jaw lifting when tightening the vice. A gentle tap with a mallet can be used to get the job down, i never bother. 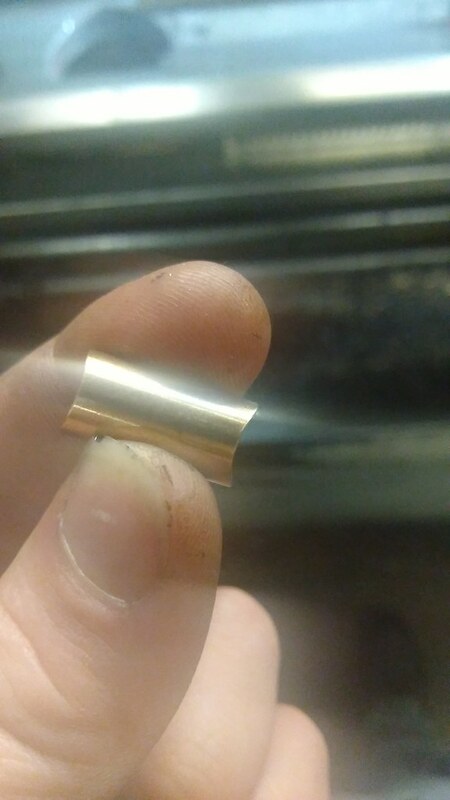 one of the joys of carbide insert face mills is the wicked burr the throw over, for people that use these, take a light cut (say 0.25mm) coming back the other way, that will then weaken the burr so it just peels off with fingers. I then use a very technical device to remove the bit of burr that's left. 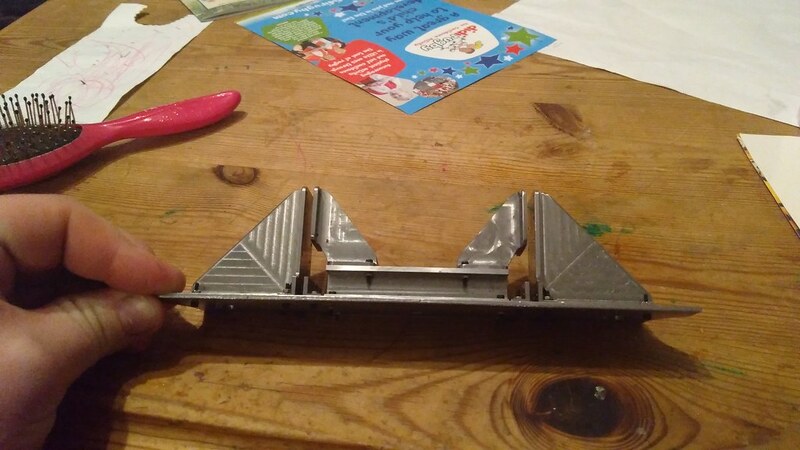 The 3rd face to machine is the one opposite the one you have just done, remember the first face goes against the fixed jaw, still use the roller and this time tap the job down to the parallels and you can bring this dimension into size. 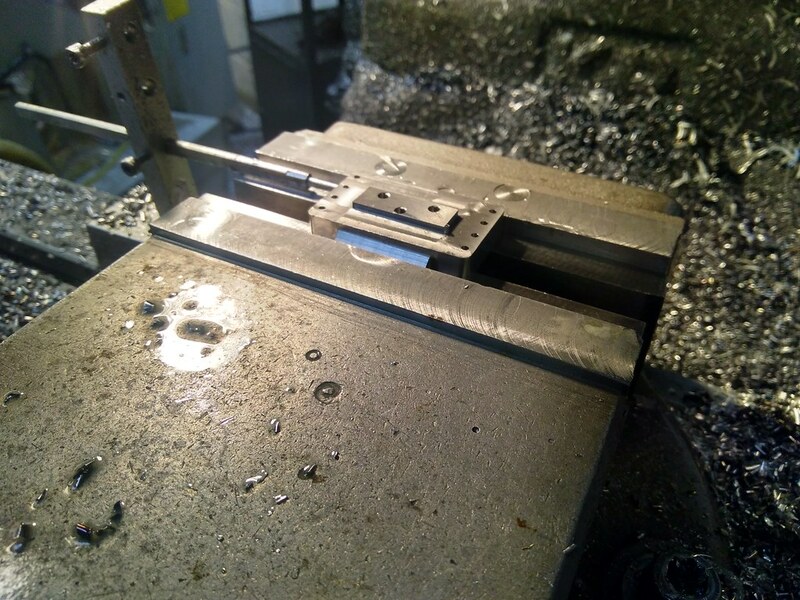 Now, if you can put the 2nd face onto a flat surface and a clock onto the 3rd face (or vise versa) any error the clock detects is in your vise, the block i was doing was about 24mm wide at this point and the total indicated error was 0.0005" which is in fact double the error in the vise. 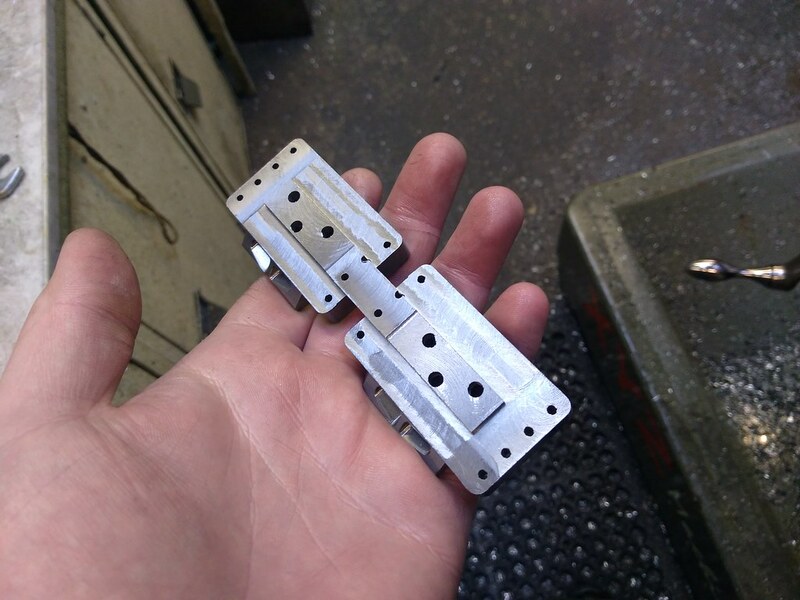 (because you have machined both faces from a common datum) Now i'm lucky to have access to some wonderful kit, but that vise is only that good because of the time spent packing out the fixed jaw with bits of fag paper ect. 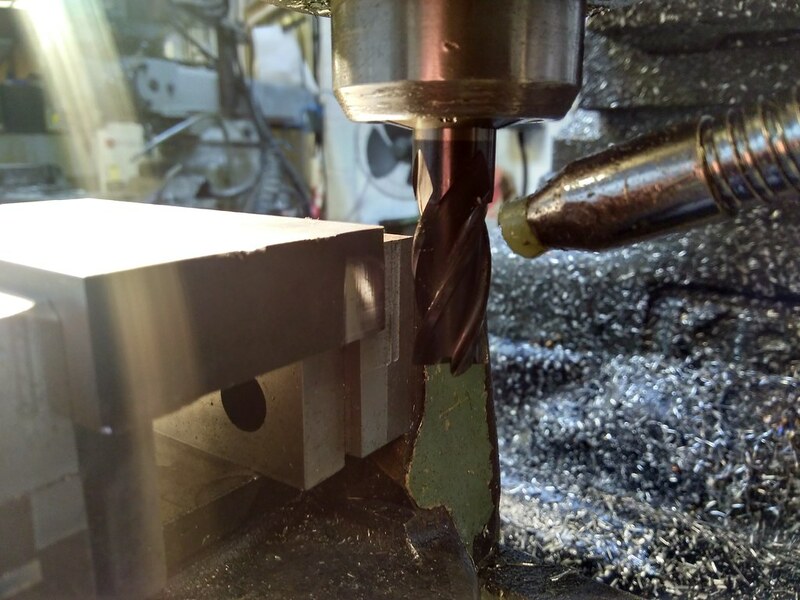 A little bit of trial and error should also get you a good vice. 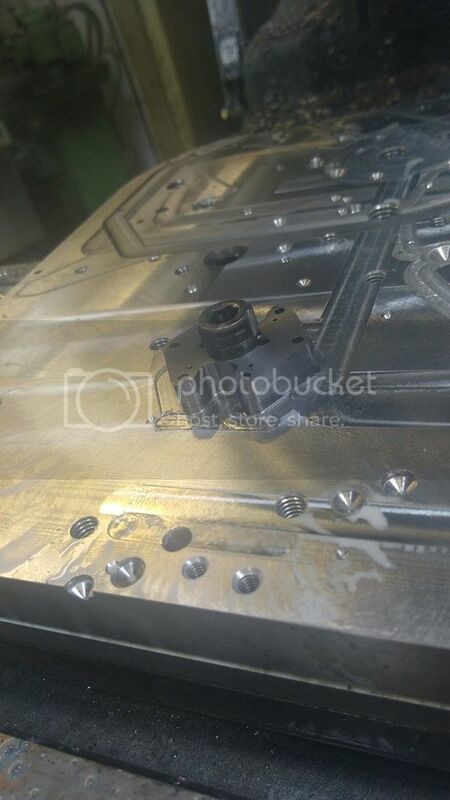 Assuming everything is ok, you can now go onto the 4th face, which is the unmachined big face. 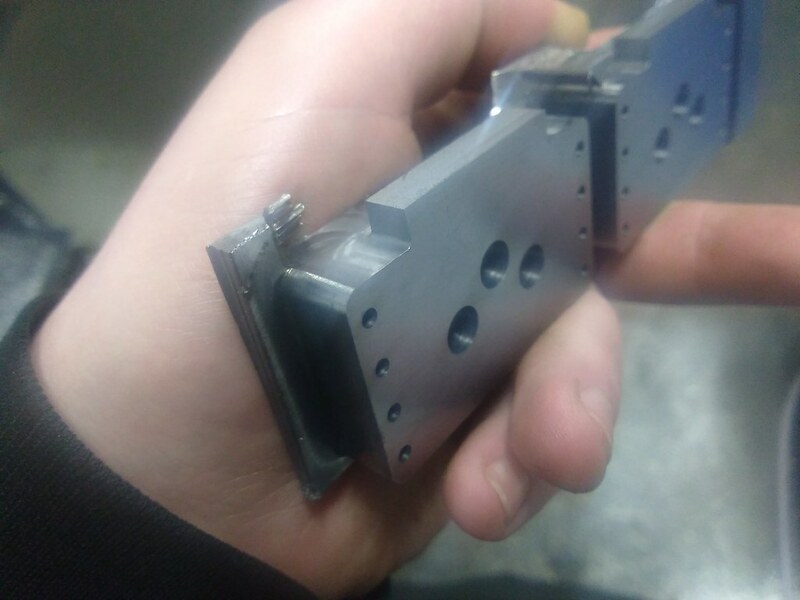 You can now find out how good things are because the block should tap down to trap both parallels, if a parallel can be moved its not down, normally if the parallel next to the moving jaw is free then the moving jaw is lifting the component, use a bigger mallet, don't tighten the vice so much. 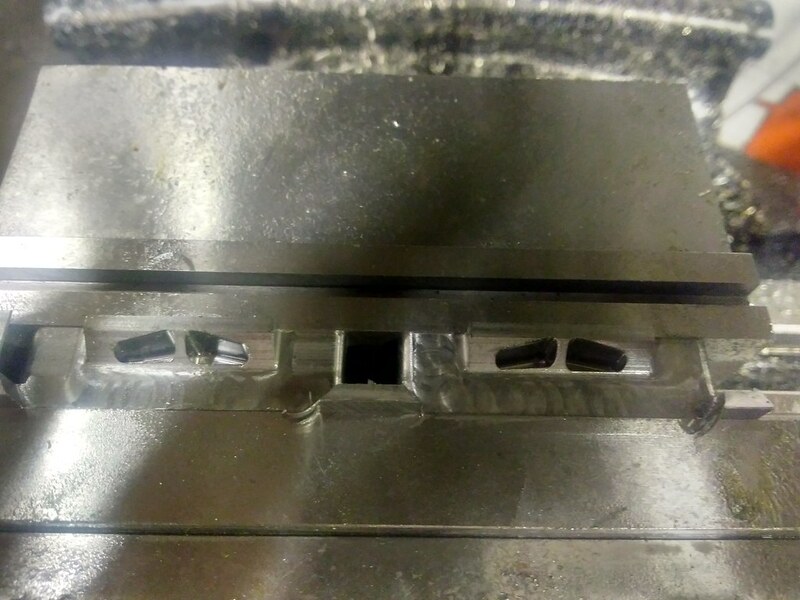 If there's a lot to come off, tighten the vice, remove the bulk, then undo and re nip the vice and tap the block down again. 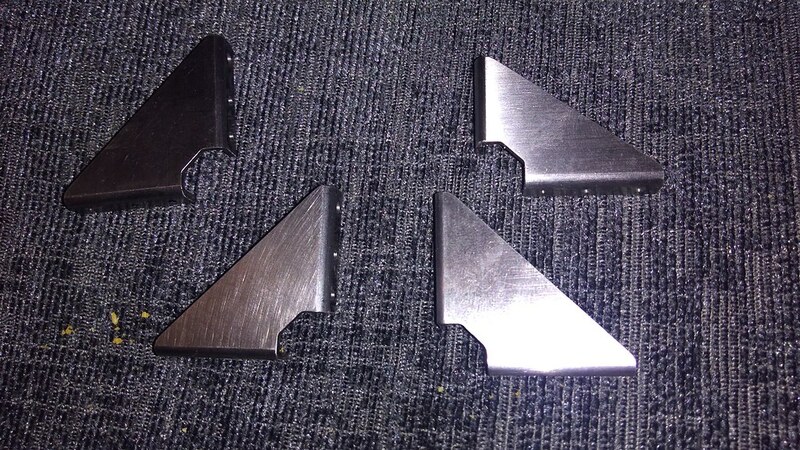 If the fixed jaws parallel is free but the other isn't free then your 2nd and 3rd faces are not square to the datum face. We can also finish this dimension to size. 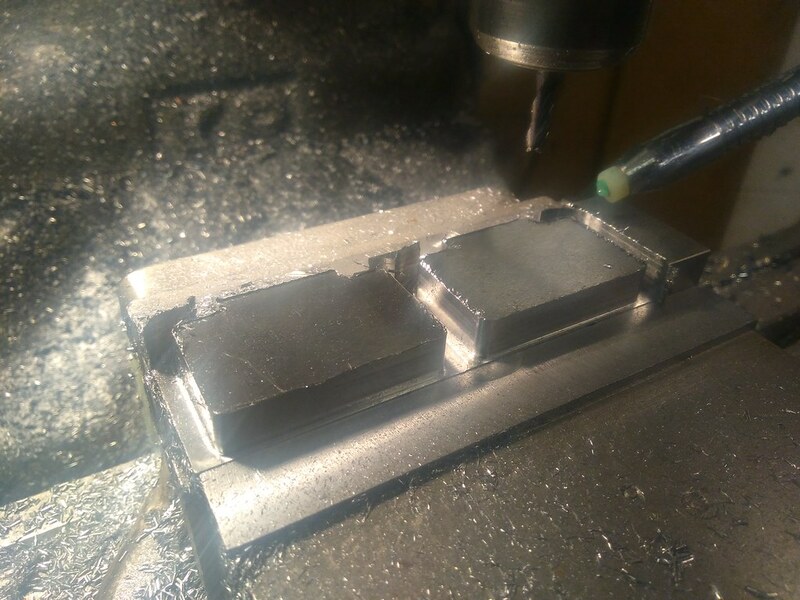 We now have 2 faces left, i used an end mill to clean 1 end up on these. And in this instance i also did this to finish the final face and the final dimension, I could of stood it up to machine the last face with the face mill. For stuff to big for the vice, you can use this setup and machine a register, then you can put an angle plate on the mill clamping the datum face to the plate and using the register either clock it true or sit the register on a parallel that's on the machine table, i'll try and demonstrate this at a later date. Hopefully that makes sense and a few of you find it useful. The stretcher has progressed a lot further than that. 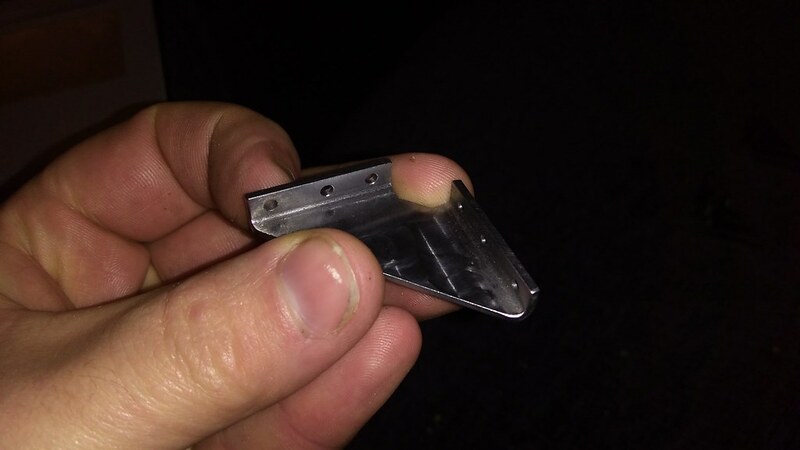 After blocking out, I machined the step for the frame spacing and drilled the rivet holes. This is the same both sides. 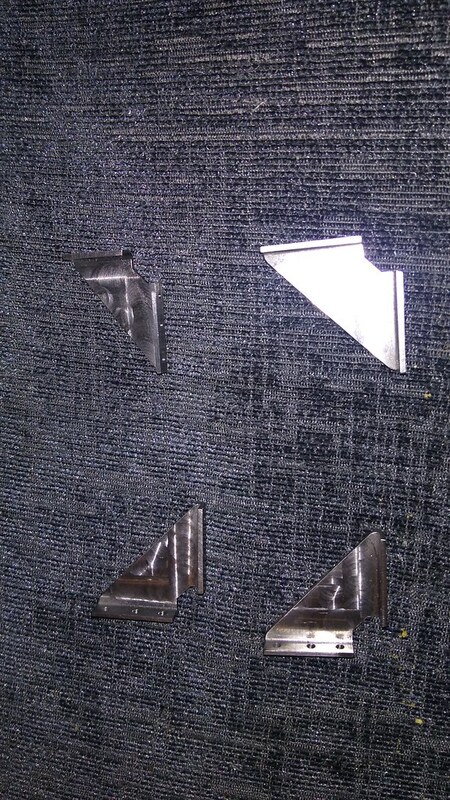 I've then machined out the 4 triangular shaped pockets. 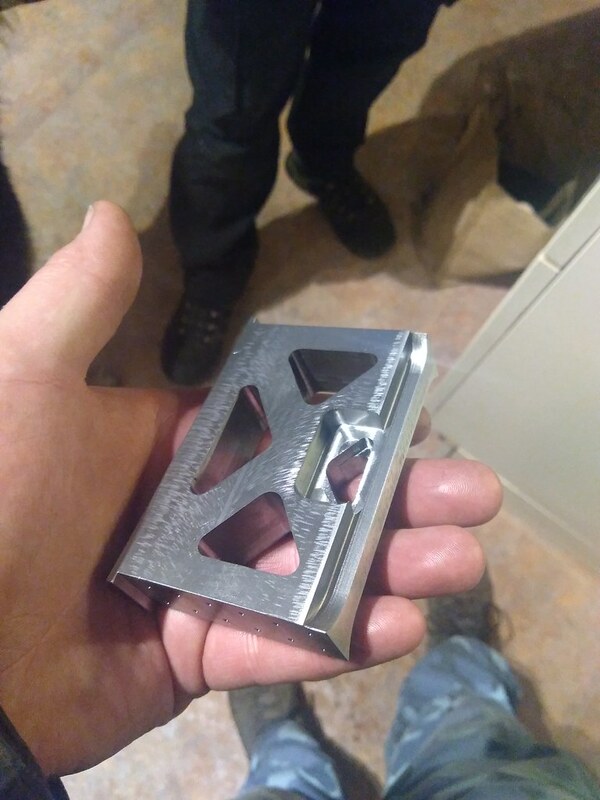 The rectangular pocket was done to allow me to get to where i needed to be with a 4mm cutter to machine the small triangular detail at the bottom of it. 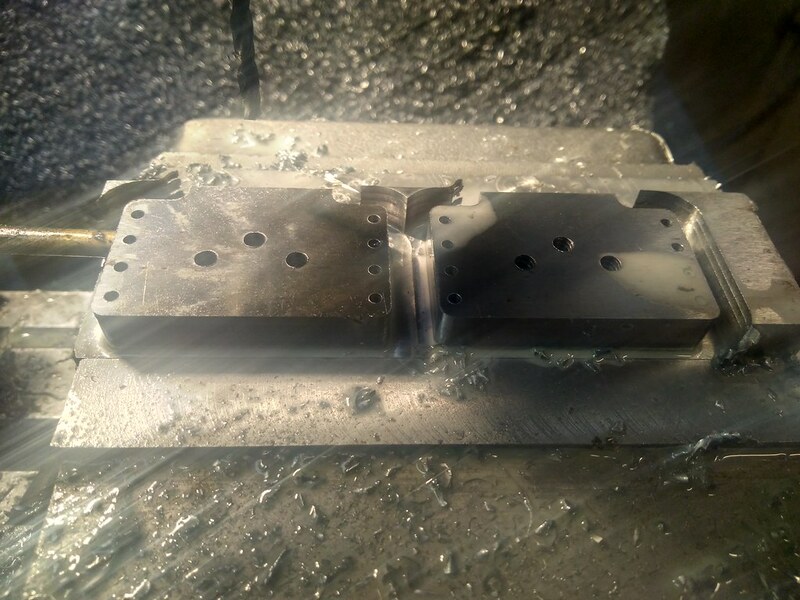 In that picture you should see the shape milled into the bottom, this is the same both sides. The stretcher is now with Ed to machine the middle out of it. It involves a lot of nibbling out corners with a very small tool which he is better equipped for. Great update, VB. Keep them coming.